BItly's Interesting Experiments with Rt.ly and Real-Time Media Map | Happenings, Marketing and Technology Advice and Thoughts! I love bit.ly and have been using it for a long time. Bit.ly has a lot of data scientists who help with innovation including my friend Hilary Mason who was with Bitly as a data scientist. I was thrilled to discover two tools in the Bitly portfolio that seemed cool, useful and help us go through the overload of content that comes our way everyday. 2. Bitly Real-Time Media Map : You can see which newspaper, Radio/TV, magazines and Online only media is popular by location and article. 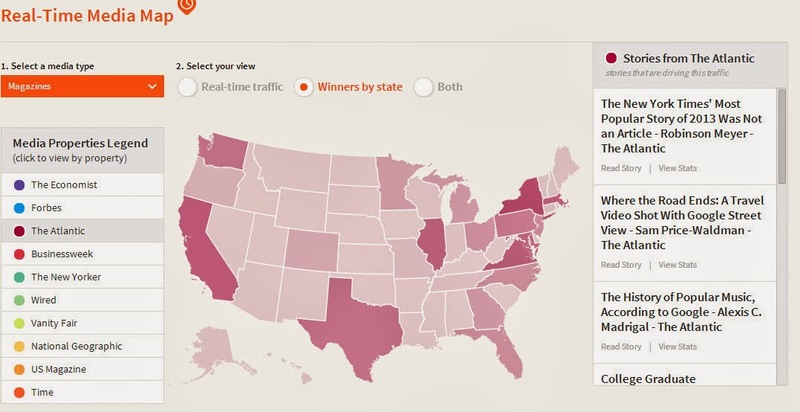 See which articles in the Economist are popular and find the states they are popular in. Check both these tools, you may end up using both as your readers and for curating content.